Examination of Reactions [4.1], [4.5], [4.6] and [4.9] shows the pivotal role of glutamate in animal metabolism and function, enabling the synthesis and breakdown of amino acids and the production of GABA. However, it is important to recognize that glutamate itself is part of the amino acid neurotransmitter system (Bradford, 1986). 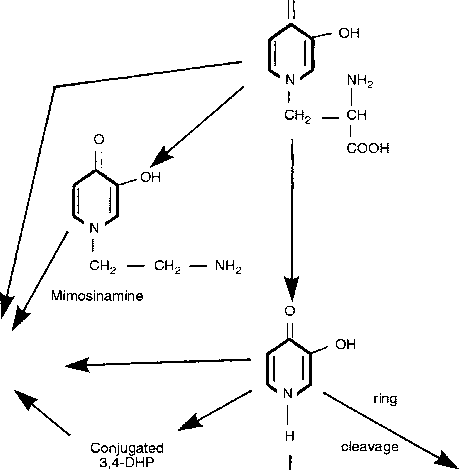 The critical roles of this non-essential amino acid should, therefore, not be underestimated. Indeed, it has been suggested that several of the non-essential amino acids may become conditionally essential because endogenous synthesis cannot satisfy immediate requirements under certain conditions. Thus, stress caused by disorders of pregnancy and lactation and microbial pathogens may induce the need for these amino acids. In this respect, the case for glutamine is particularly convincing. It serves as a precursor of purines (Fig. 4.6), pyrimidines (Fig. 4.7) and amino sugars. It is also the preferred fuel for the cellular metabolism of intestinal mucosa and an obligate nutrient for the immune system (Nieto et al., 2002). Other functions include involvement in the maintenance of acid-base balance, prevention of peripheral hyperammonaemia and regulation of cellular macronutrient metabolism. Glycine is another amino acid associated with multifunctional roles, being involved in the synthesis of purines (Fig. 4.6), creatine (Fig. 4.8) and haem (Fig. 4.9). Fig. 4.8. Biosynthesis of creatine from arginine and glycine. Enzymes: 1, transaminase; 2, guanidinoacetate methyltransferase. Creatine supplements may exert beneficial effects on pork quality (James et ai, 2002). Together with aspartate, glycine is a component of the amino acidergic system of neurotransmitters. Fig. 4.9. Biosynthesis of haem from glycine. Enzymes: 1, 8-aminolaevulinate synthetase; 2, aminolaevulinate dehydrase. The critical functions displayed by the non-essential amino acids means that they must be synthesized from essential amino acids and/or derived from dietary sources. Optimum ratios of the essential to nonessential amino acids exist for particular functions and species of animals (Chapter 6).